Did you breathe in any CFCs today? If you said “no,” think again. CFCs (chlorofluorocarbons) are colorless, odorless and tasteless gasses, and are impossible to detect with the human senses – but they’re everywhere. Their impact is far from invisible. With each breath – every man, woman, child, mammal and bird inhales CFC gasses. The good news is these gasses are at a safe level for human consumption. The bad news is our ozone and climate are affected, and the jury’s still out on the damage to the microscopic world and our ecosystem. Gas has been produced and vented into our air space without grassroots awareness. A hundred years ago, there were zero CFCs in the atmosphere. However, billions upon billions of pounds of these chemicals were produced in the 1980s and ‘90s. Chlorinated and fluorinated gas used in aerosols, solvents and refrigerants were manufactured and innocently vented for 50 years before anyone realized they could alter life on Earth. The United States banned production of these products January 1, 1996. However, Environmental Watchdogs “sees” that hundreds of millions of pounds of CFCs are being spewed into our atmosphere every year – yes, and that includes the United States! Now, CFCs are known ozone-depleting chemicals and contribute significantly to global warming/climate change. Simply put, CFCs are pollution. Environmental Watchdogs wants to do its part to remove these chemicals and other hazardous waste from the air for a healthier environment – and show you how you can get involved. Every man, woman and child – and even every dog – can do a part to change this Proliferation of CFCs in the environment with help from Environmental Watchdogs. Environmental Watchdogs offers a simple effective solution: Read on or contact us to find out how easy it can be to make positive changes. We can each do a small part toward cleaning up our environment – and it all adds up to a big impact. We offer a variety of carbon credit purchase programs aimed at reducing the amount of CFCs and other pollutants in the air. We strongly encourage you to learn how you can get involved in innovative clean air movements through our two pet projects, namely “Environmental Heroes” and “Grassroots”. Carbon emissions come from fossil fuels being burned for heat, electricity, automobile, etc. For example, our coal production (600,000,000 tons) to supply our electrical needs for 1 year would fill enough rail cars that would go from New York to California back to New York and continue 3 more times around the earth! The Environmental Watchdogs featured at EnvironmentalWatchdogs.net are Truthful, Doubtful, Insightful, Playful, Helpful, Faithful and their seemingly all-knowing mother, Momma Eco. Together, they are responsible for cultivating the image of EnvironmentalWatchdogs.net, and for spreading the word about global warming and the solutions. Playful: At EnvironmentalWatchdogs.net we’re learning how people cause global warming, and what our masters can do to fix it! Truthful: As Environmental Watchdogs, we see all of the colorless, odorless, tasteless gasses that our masters leaked, often unknowingly sending it into the atmosphere, creating hazardous air pollution. We feel that we must encourage our masters to clean up our living space. 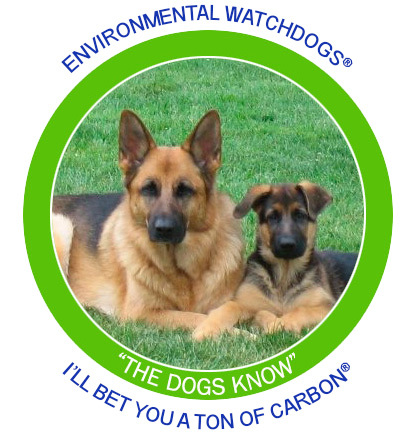 Doubtful: So, with the people at EnvironmentalWatchdogs.net, we’re encouraging people to purchase carbon credits. Playful: What are carbon credits? Helpful: Carbon credits cap total emissions and let the market assign a monetary value to trading shortfalls, if they happen. When purchased from EnvironmentalWatchdogs.net, they’re a great gift for a pet owner, or anyone who loves the environment. Momma Eco: When people purchase carbon credits on behalf of their pets, they are not only giving birth to a new Environmental Watchdog, but with each $6.00 purchase, they are also removing one ton of carbon or carbon equivalent from the atmosphere. Faithful: Hey Insightful, I’ll bet you a ton of carbon this idea catches on! Insightful: I’m afraid I can’t take that bet. I hope, for the sake of our world, that it does. Learn more about the Environmental Watchdogs and the people at EnvironmentalWatchdogs.net by browsing the rest of our website and informative articles.